You'd better stay away from them – unless you're in the audience to see Wilders from up close ;-) A "rechtbank" is a court of law. "Recht" is Dutch for "law" or "justice" and you will see this word appear in all forms: the judge is a "rechter", to become a judge he studied law ("rechten" or "rechtsgeleerdheid"), and it's his duty to deliver judgement ("rechtspreken") for the sake of justice ("gerechtigheid"). Literally, "recht" is "straight". – "De rechtszaak wordt morgen behandeld door de rechtbank." – "Als een juridische zaak spoedeisend is, wordt een kort geding aangespannen bij de rechtbank." – "Ga je de zaak (in der minne) schikken of ga je hem voor de rechtbank brengen?" – "Omdat een van de getuigen onwel werd, werd de zitting verdaagd." – "Het Internationaal Joegoslavië Tribunaal in Den Haag klaagde Milosevic in 1999 aan; in 2002 verscheen hij voor de rechtbank." – "<Plaatje:> Politicus Wilders werd verdedigd door een van de bekendste advocaten van Nederland, Moszkowicz, en vrijgesproken." – "Recht doen (aan iets)": to do justice (to something). – "Voor het gerecht dagen": to summon. – "Een zaak aanhangig maken": To bring a case before the court. – Recht: the justice, the law [noun] [het recht, <no plural>]. – Wet: the law [noun] [de wet, de wetten]. – Tribunaal: the tribunal [noun] [het tribunaal, de tribunalen]. – Rechter: the judge [noun] [de rechter, de rechters]. – Advocaat: the lawyer [noun] [de advocaat, de advocaten]. – Gedaagde: the defendant [noun] [de gedaagde, de gedaagden]. – Gerechtshof: the court of law/justice [noun] [het gerechtshof, de gerechtshoven]. – Wetboek van Strafrecht: the penal/criminal code [noun] [het Wetboek van Strafrecht, <no plural>]. – Openbaar Ministerie: the Public Prosecutor [noun] [het Openbaar Ministerie, <no plural>]. The difference between "rechtbank" and "gerechtshof" is that the former is the District Court and the latter the Court of Appeal. 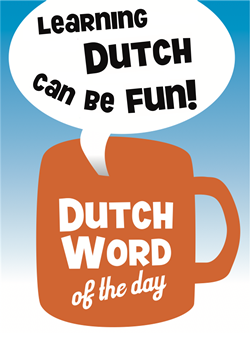 This entry was posted in Dutch word of the day, DWOTD 1.0, Vocabulary Basic and tagged advocaat, gerechtshof, recht, rechtbank, wet by Dutch Gurus. Bookmark the permalink. This is a good entry for me since I am working as an expat in the legal field in Amsterdam 🙂 It was noted to me though that this post is not entirely correct. Specifically, Rechtbank and Gerechtshof are not synonyms. The former is the District Court, the latter the Court of Appeal. That’s not the sort of attention to detail that won you an award! I wanted to reward you with the opportunity to come up with the translation yourself, but it appears that Laura already did it for you! @Shirley – Hi, thanks for your interesting comment. I see that Laura updated the post in the Extra, but I’m still curious. What about the “Europees Gerechtshof”; how would you translate that? If I look up ‘district court’, I get “arrondissementsrechtbank”; what is that? Arrondissementsrechtbank is the correct translation of district court. In the legal field we don’t usually refer to the ‘arrondissementsrechtsbank’, but just to the ‘rechtbank’. This is because there is only one type of ‘rechtbank’. As mentioned by Shirley, the court of appeals is the gerechtshof. The supreme court is the Hoge Raad (or, for administrative law the Raad van State, Centrale Raad van Beroep or College van Beroep voor het Bedrijfsleven, depending on the type of case). So in english you need to specify the type of court by specifically calling it a ‘district court’. If you say ‘court’ you could mean either one of the above types of courts. In Dutch however, saying ‘rechtbank’ automatically indicates the district court. And finally (sorry for the long post) Het Europees Gerechtshof is the European Court of Justice. Because ‘bekendste’ isn’t the same as ‘best’ is it? Hi Evelien – thanks for you comment. You are right and I’ve decided to change the translation (as “bekendste” is a more interesting word than “beste” 😉 ). Hallo, ik hoorde van jullie via de Wereldomroep. @Nicolaas -Thanks, that clarifies it!